Construction practices and equipment installations in earthquake-prone areas pose a special set of challenges to engineers. No structure is isolated from seismic activity. Recognizing this danger, governing jurisdictions in seismically active areas — such as California, Alaska and other affected areas — have adopted codes and standards. These standards require structures and equipment to maintain their integrity in spite of earthquakes, making seismic testing a vital part of validating prototypes and designs. Even if specific codes and standards do not exist within a given earthquake-prone jurisdiction, engineers may still need to provide assurance that their designs will withstand certain amounts of seismic activity. This helps protect equipment and provides safety to personnel. NTS, in accordance with the State of California’s Office of Statewide Health and Planning Division (OSHPD), now offers full seismic testing, certification, and report submittal for testing to AC-156, “Acceptance Criteria for Seismic Certification by Shake Table Testing of Nonstructural Components”. The seismic test specification, as maintained by ICC Evaluation Service, Inc. (ICC-ES), specifically defines the testing and requirements for equipment installed into new or updated hospitals in the State of California. In addition to being recognized by the State of California’s OSHPD, NTS also holds A2LA ISO 17025 laboratory accreditation. NTS is accredited to conduct this testing at our Fremont and Fullerton, CA labs, as well as in Boxborough, MA and Huntsville, AL. NTS is the largest independent testing laboratory in North America, and our seismic testing equipment includes multiple single axis, tri-axial, bi-axial seismic machines. With this level of capability spread out from coast to coast, we are strategically positioned to provide excellent service to customers. As long as the test item in question will fit onto one of our shaker tables and without exceeding its weight limit, we can test it. Nuclear equipment– NTS offers replacements for many electrical and mechanical safety-related components that are no longer available from the OEM. These systems include instrumentation, batteries, gauges, and more from manufacturers such as Siemens, GE, and Yokogawa. With three separate single axis, triaxial, and biaxial seismic machines, we can help resolve licensing issues or support hardware retrofit and replacement programs to meet regulatory codes and requirements. Our seismic and EQ test services for nuclear components and systems include thermal and radiation aging, seismic testing, LOCA testing, functional monitoring and more. Turbine generators and compressors— Some turbines and compressors can rotate at tens of thousands of revolutions per minute. Therefore, shaft bearings and turbine/compressor blades with close clearances to turbine housings are especially prone to stresses caused by seismic activity. If too much deflection of moving parts results during a seismic event, there is a large potential for catastrophic failure. Flywheel energy storage modules — Flywheel energy storage systems have potential issues that are similar to what turbine generators and compressors experience. Electrical switchgear — Equipment of this nature is often capable of handling hundreds of amps at all ranges of voltages. 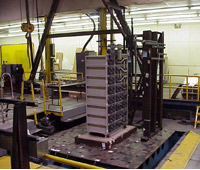 Connections, supports, circuit protection devices, and structural members need to be able to withstand seismic activity without becoming compromised. Compromised connections and electrical equipment may not noticeably malfunction until after the event that caused the compromise. But when it does malfunction, it may catastrophically fail and lead to personnel injury and damage to property. Emergency standby equipment — When earthquakes happen, power outages often occur. When power outages occur, emergency standby equipment needs to remain undamaged and functional so it will operate reliably in the event of an emergency. Commercial/industrial equipment — There are various reasons for ensuring seismic survivability exists. In some cases, there are safety concerns where damage to equipment can pose hazards to personnel or the public. In other cases, concerns are purely financial. Please contact us today if you have any questions about the capabilities of our seismic testing equipment. Learn more about how NTS can help you meet your seismic testing requirements.